A lot of people don't know that my father is black. In 1980 when Giggs was six years old his father switched rugby codes and signed for Swinton RLFC forcing the whole family to move north to Swinton a town in Salford Greater Manchester. He also became the first man ever to score in 16 different Champions League campaigns moving clear of Raúl who was tied with Giggs on 15 seasons. On 18 December 2009 Giggs signed a one-year contract extension with United keeping him at the club until June 2011 taking him past the 20th anniversary of his first professional contract and that of his first team debut – a rare occurrence of a player reaching the 20-year mark with the same club and with unbroken service. 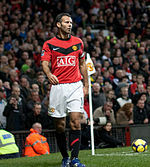 Giggs is known for his tireless running ball possession and ability to create goalscoring opportunities for those around him. On 10 October 2011 Giggs was honoured with the 2011 Golden Foot Award. He was the first player in history to win two consecutive PFA Young Player of the Year awards (1992 and 1993) though he did not win the PFA Player of the Year award until 2009.